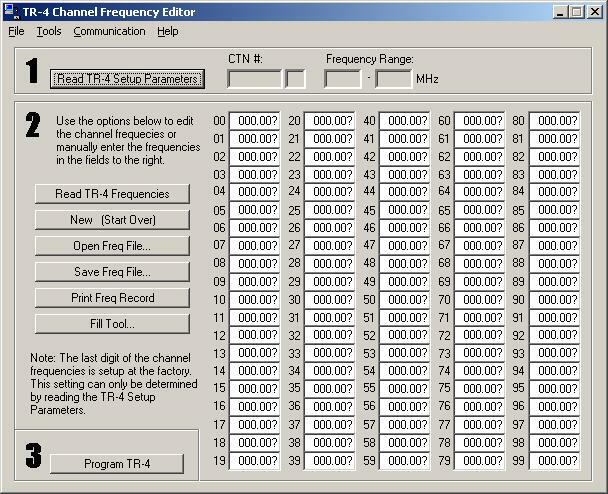 ﻿ TR-4 Channel Frequency Editor - Software | Telonics Inc.
TR-4 Channel Frequency Editor is the programming interface for the TR-4 receiver. It allows you to program the 100 TR-4 channels on your PC and send them to a TR-4, or read the existing channel settings in a TR-4. It also allows you to save or print a record of the channel assignments for a TR-4 receiver. 2018.11.15 What's new in version 3.05? Fixes a bug that had crashed the program to crash on startup for some Windows 10 users. 2013.07.18 What's new in version 3.04? Fixes a bug that had caused versions 3.00-3.03 to read the wrong frequency for channels that were disabled (reads 483.640MHz instead of 000.000MHz). 2011.12.16 What's new in version 3.03? Requires an authorization code to read or program TR-4 receivers. 2011.12.07 What's new in version 3.02? Fixes a bug that had prevented users from using printers with spaces in the printer name. Adds an export feature so users can save the programming record to a text file. 2011.06.27 What's new in version 3.01? Supports communication with units that have a blank CTN. 2011.05.09 What's new in version 3.00? Supports any available COM port instead of only COM1-4. Provides more-reliable communication with TR-4. Help system supports Windows® Vista and Windows® 7. Allows full printer selection instead of only LPT-1 & LPT-2. Provides a list of recently used .tr4 files. Installs start-menu shortcuts under Telonics group instead of TR-4 group. Changes application icon to the Telonics elk. What's New in Version 2.06.0000? Bug fix: The program was not editing channels properly under Windows® XP.